In this step, we’ll experiment with variations on Central vowel sounds. So far, we’ve been working our way through the various non-English vowel sounds, starting with Gliding back and forth through the Close Vowels, then Sliding downward with the Front Vowels, and then with the Back Vowels. Then we took a day to explore the difference between "schwa" and "uh" as in comma or strut. These last two are, in many ways, "Central" vowels in English, though the strut vowel is classified as a Back vowel by the International Phonetic Association, or IPA. In some languages, the sound closest to [ʌ] is a back vowel, whereas in English, there is a range of pronunciations for the vowel in strut. In some accents this is very far back (as in parts of Texas), while in others (e.g. in London working class accents, aka "Cockney") it is quite far forward, in the range of where the IPA puts the rarely used [ɐ] symbol. For this experiment, we’ll play with the sounds we establish in our contrast of the "schwa" and "uh" vowels. To begin, let’s start with a more closed version of "schwa", represented by a "reversed "e" in the IPA, [ɘ]. This vowel is, essentially a more closed version of "schwa". That’s easy! Simply say that "schwa" sound with your mouth almost shut. 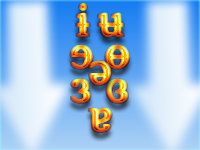 Next we’ll do rounded version of this new sound, represented in the IPA by [ɵ], a barred "o" symbol. If you think of this sound as a centralized [o], it might be easier to say! Start with a "pure /o/" sound, as if you were saying goat with a Scots accent. Then move the centre arch of your tongue forward, as we did when we played with gliding between [i] and [u], only with the mouth more open. In other words, the [ɵ] is like a more open [ʉ] vowel, which we covered here. Now, let’s look at the Central vowel that is more open than "Schwa," namely the vowel used in "r-less" accents (a.k.a. "non-rhotic" accents), such as Received Pronunciation, and many other regional accents of England. This is the r-less version of the vowel found in nurse words; many rhotic speakers, if you ask them to say words like word, heard, nurse, first, they will instinctively make the correct sound for this vowel. The IPA’s symbol for this sound is [ɜ]. ̆(For those with a rhotic accent, who have r-colouring on this vowel, the symbol for that is the same, plus an added diacritic that looks like a little "hook" or "wing" on the upper right hand corner of the symbol: [ɝ].) The rounded version of the non-rhotic vowel is represented by the IPA symbol [ɞ]. To make this sound, think of the non-rhotic sound found in words like nurse, and round your lips forward strongly. You may find that this makes you sound a little like a poor impersonation of Arnold Schwartzenegger, or perhaps like "Hans and Franz" saying "Girly Man". If you’ve been following along from when we started, you’ve probably gotten a handle on all the vowels of the IPA by this point. That’s amazing. Our next trick is to begin to play with these new sounds in fun, improvizational ways, so that we begin to "own" the sounds. It’s great that you’ve made these sounds a few times, but now you need to engage with them in ways that get you out of your head and into an expressive communication process, through the sound.